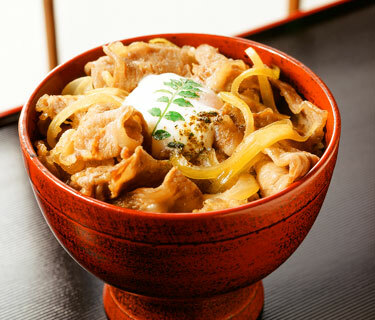 Gyu-don (beef bowl) is a very popular dish that also appears on the menu at fast food restaurants in Japan. You don't want to miss this recipe, which tells you how to make the "magic sauce" by mixing dashi, mirin and soy sauce in a proportion of 7/5/3, allowing anyone to prepare this delicious rice-bowl menu. The fat in Hitachi Beef is very tender and its exquisite juicy flavor permeates into the rice. 1) Cut beef into 2 in. (5cm) wide strips. 2) Cut onion in half lengthwise and slice it finely. 3) Add dashi, mirin, soy sauce and onion into a pan and place on heat. 4) Cook the onion until tender, reduce heat and add the beef slice by slice. 5) When the beef is well separated, increase the heat and cook until the beef changes color. Be careful not to overcook. Fill the bowl with cooked rice and cover it with (5) above. Add the cooked sauce in accordance with your taste. Place the onsen egg and kinome on top before serving. Use of the name “Hitachi Beef” is permitted only for beef from cattle raised for more than 30 months under a refined rearing regimen consisting of finely selected feed, and has an excellent meat quality. Hitachi ribs, sirloin, fillets and rump are tender with adequate marbling, which is well-suited to the Japanese taste. Onsen eggs can be prepared by boiling eggs in 176-degree F (80℃)water for five minutes. When the eggs are boiled at a low heat, the surface of the egg white hardens slightly while the inner part of the egg retains its liquid form.